If you live in the USA and plan on driving an automobile, then you need to be covered. That simply means buying the state minimum insurance, in the least. Today, with the ease of online shopping, buying car insurance is easier than ever. All it takes is a few clicks of the mouse and you can quote quoted, compare rates and buy a policy all over the web. While that might be convenient, keep in mind that an insurer can drop you just as easily as you can buy a policy. Thousands of customers are notified each and every day that their coverage is cancelled. To avoid this happening to you, let’s check out why insurance companies can cancel your coverage, so you can stay insured. In the United States, insurance regulations and rules are handled at the state level. Each state has laws that insurance companies must follow to remain licensed in a particular area. In nearly all states, an insurance company can terminate your car insurance policy, for any reason, in the initial 60 days. After the 2 month period is up, insurers must then have a valid and specific reason for canceling your insurance. Let’s take an up-close look into some of the more common reasons companies cancel policies. 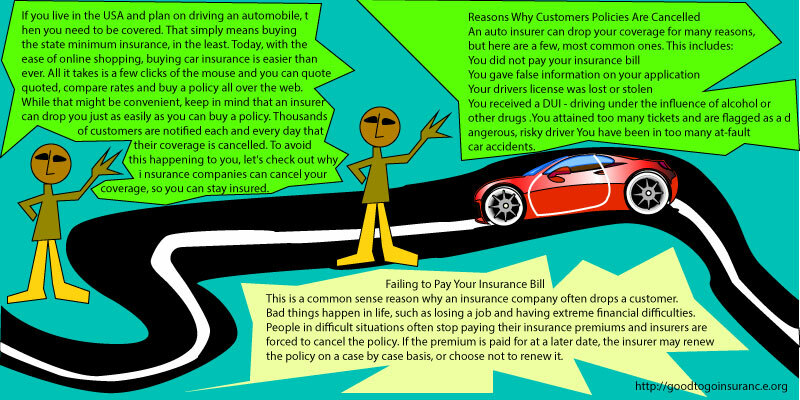 This is a common sense reason why an insurance company often drops a customer. Bad things happen in life, such as losing a job and having extreme financial difficulties. People in difficult situations often stop paying their insurance premiums and insurers are forced to cancel the policy. If the premium is paid for at a later date, the insurer may renew the policy on a case by case basis, or choose not to renew it. An insurance policy, simply put, is a contract between a company and you. In exchange for coverage, you agree to pay a set amount on an agreed to time period. Usually, that is annually, semi-annually or every month. If you do not make your scheduled payment on time, you can expect your coverage will get dropped after a small grace period is up. If you lose your coverage, do not drive. Park your car in a safe and secured place until you get it insured again. Driving without car insurance can make your situation much worse. Tickets can cost over $1,000 and repeat violators can have their automobile impounded, which can cost hundreds to get it out. Carriers make money by insuring customers that do not get into expensive vehicular accidents. Policyholders that get into 2 or more costly accidents in a year or two can have their coverage dropped. The risk to reward ratio to the insurer is just not there. These days, accidents are getting more and more expensive. Automobiles are very costly to replace and repair, not to mention outrageously expensive medical care. If you do get dropped, don’t panic. Go online at leading sites like goodtogoinsurance and apply for new a new policy. One of the fastest ways to get dropped by an insurance provider is to get convicted of driving while intoxicated. Insurance companies know that there is a high rate of repeat behavior and also a likelihood of a serious accident going forward. Drunk drivers not only put their lives in jeopardy but those motorists that share the road when they are illegally driving intoxicated. Another way to get canceled by your carrier is to have too many reckless moving violations on your record. This shows a pattern of irresponsibility and dangerous driving. After the first 2 offenses, your insurance premiums might go up by 30% or more. After 3 violations, your insurer will probably drop you. If your policy is canceled, you can usually find another provider like Good to Go insurance that will cover you. If you get a policy from a carrier and are found later on to have not told the truth on your application, then you can get dropped. Insurers take the information you provide very seriously and this is how they base their premiums. Lying and falsifying on the application can not only get you cancelled by an insurer but can land you in serious legal trouble as well. Always tell the truth about where you live, how many miles you drive each month, and how many accidents you have been involved in. Sooner or later the truth will come out and it will cost you more money in the long run, in higher rates. If you have had your insurance cancelled then you need to get online and start looking for a new carrier. You should compare at least 10 auto insurance rates online. A great place to do this is at good to go insurance company. They have an easy to use-site that allows you to compare the cheapest rates from all the top insurance providers nationally. The quote process only takes about 4 or 5 minutes and there is never any obligation to buy a policy. Get started now and lower your insurance rates.